Adding or replacing a faucet aerator is an amazingly simple fix that can have a big payoff in conserving water and cutting your utility bills. With a single tiny change to the faucets in your kitchen and bathrooms, you can achieve significant savings on your water bill, even while doing your part to mitigate the global water crisis. The key? 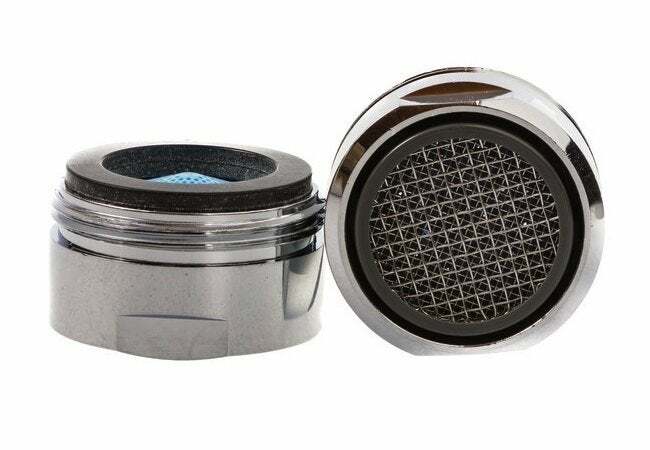 A low-tech device known as a faucet aerator. According to the Environmental Protection Agency, adding an aerator to each faucet can save the average family about 700 gallons of water per year. That roughly translates to a savings of $48 each month. 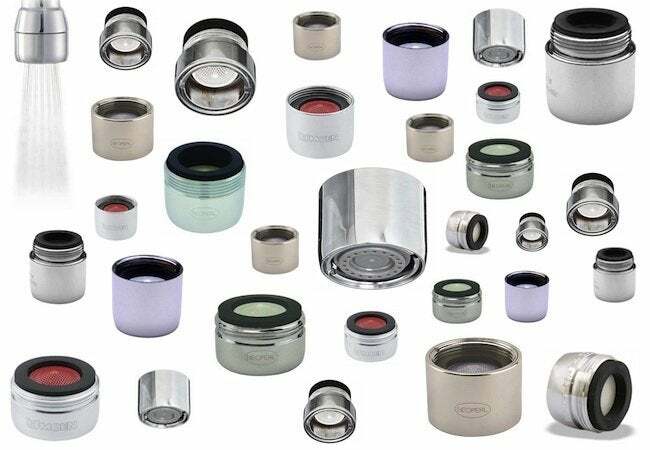 Best of all, just about anyone can install a faucet aerator on his or her own, and the modification requires minimal investment, with the cost of individual aerators rarely exceeding $10. Disc-like in shape, an aerator simply screws onto the tip of a faucet. There, it acts as a sort of filter, mixing air into the water leaving the faucet so that it exits, not in an unrestricted stream, but in a parade of tiny droplets. The aerator also limits the flow of the faucet by narrowing its width (either in a fixed or adjustable way). Working together, the injection of air and the narrowed opening drastically reduce water consumption. Even so, aerators still deliver a steady, even flow, so you likely wouldn’t even notice a difference in performance between a faucet with an aerator and a faucet without one. In other words, there’s really no downside. Flow rate aside, several other differences exist among faucet aerators, in part to accommodate the rich variety of faucets in common use across the country. Because faucet tips vary in size, so too do the aerators that attach to them. Both standard- and junior-size aerators are available; the former is similar in circumference to a nickel, while the latter is closer to a dime. Meanwhile, aerators also differ in how they screw onto their host faucet. “If there are male threads on the faucet, choose a female-threaded aerator, and vice versa,” O’Brian advises. Finally, aerators vary in their style of output. Some offer the traditional, columnar jet, while others produce a more diffuse spray, somewhat like a small shower head. Like other hardworking, functional elements of the home, faucet aerators don’t last forever. The device contains three main component parts—mounting runs, a screen, and a flow restrictor. Those last two are likely to become clogged over time, gradually compromising water pressure in the faucet and therefore limiting flow. In fact, if you are having problems with low water pressure in your kitchen or bathroom, check the faucet. “There may already be an aerator you don’t know about,” says O’Brian, “and it may be long past its prime.” Removing an aerator is a simple matter of unscrewing it from the tip of the faucet to which it’s attached. You can also use an adjustable wrench, gently, if necessary. Installing a new aerator? Note that if your sink features a decades-old faucet, it may not have an existing aerator, and if the faucet lacks the screw threads necessary to secure the attachment, it may simply be incompatible with one. If, however, you have a compatible faucet, O’Brian of SupplyHouse.com explains that “it’s a very easy swap.” Unscrew the existing aerator, if there is one, then screw in the new or replacement model. “Really, it takes no longer than a few minutes,” O’Brian concludes. For today’s homeowner, there’s no quicker, easier, or more cost-effective way to put a dent in your monthly water bills. Plus, there’s comfort in knowing that as drought complicates life for millions of people in the United States and abroad, you’re doing your part to conserve.